In 1918, after the death of the Romanovs, the House of Fabergé was nationalized and ransacked by the Bolsheviks. Fabergé and members of his family left Russia on what was to be the last diplomatic train to Riga, not realizing that they would never be able to return to their beloved Russia again. According to author Géza von Habsburg: "When Fabergé saw that all was lost - all of the members of the Imperial family on Russian soil had been murdered - he decided that was it, his whole world had collapsed, and he fled to Switzerland, where he died in 1920 of - I would say - a broken heart." Soon after the revolution, the contents of the Romanov palaces were confiscated by the Bolsheviks. 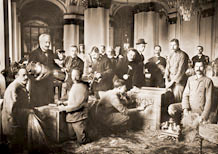 Most of the Fabergé eggs, along with masses of Imperial gold, silver, jewels and icons were inventoried, packed in crates and taken to the Kremlin Armory. Several eggs disappeared during the looting and pillaging of the palaces. The only egg not found at the time was the Order of St. George egg, which the Dowager Empress had managed to save, along with her other valuables, when she was evacuated form Yalta to England aboard the British battleship Marlborough. "All the other jewelry and the eggs were sent, by order of Lenin, to Moscow and stayed there," says Von Habsburg. "They were lost in some dark passage in the Kremlin Armory storerooms; nobody knew where they were." There the crates containing the eggs remained, unopened, guarded by Kremlin staff. But Lenin's efforts to preserve Russia's cultural heritage were undermined when Joseph Stalin came to power. Still so closely associated with the decadence of the Romanovs, Fabergé's eggs were initially undervalued. 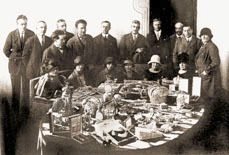 Before his escape, Fabergé's son Agathon had been imprisoned by the Bolsheviks and released briefly to evaluate the jewels and gemstones confiscated from the Imperial family. He was later jailed again when they found it difficult to sell the stones at the prices he had quoted. swept into oblivion, the eminent businessman and socialist sympathizer brought ten of the eggs to America in the early 1930's. Hammer set up business and heavily marketed and promoted the sale of these riches, but during the Depression years, even the most stable American fortunes had faltered. A friend of Hammer's ironically observed that while the Fabergé eggs were indisputably beautiful, they were not, in fact, edible. According to Géza von Habsburg: "Hammer arrived here in New York in 1931 with thousands of Russian works of art to be sold on behalf of the Soviets. At the time there was no money... deepest Depression... nobody was interested... until he struck on the idea of marketing these things through department stores. And he took them through North America, from the East coast to the West coast, stopping at department stores in every major city and touting these things, lecturing about how he discovered these things. And they caught on." There were five major collectors in the early days here in the United States: Matilda Geddings Gray, Lillian Thomas Pratt, Marjorie Merriweather Post, India Early Minshall and Malcolm S. Forbes. There were thousands of Fabergé pieces in the palaces of the Romanovs, most now scattered across far away lands in the many collections around the world now. Of the fifty Imperial eggs made, only ten remain in the Kremlin. Eight Imperial eggs are still missing. Collectors have paid millions for an individual egg, but some originally sold at auction for as little as four or five hundred dollars. It might strike some as ironic that a Communist regime would allow the lion's share of these Russian national treasures to fall into the hands of a corporation that publishes a magazine called The Capitalist Tool (Forbes Magazine Collection.) But perhaps such irony misses the point. The true worth of the eggs lies in the view they offer into very personal life of a family - an extraordinary family, but a family all the same.